In the portion of Psalm 63 today, David gets his whole body in the act. He wants his eyes to see God. He wants his lips to praise God. He wants his hands to lift in prayer. He wants his teeth to sink into God and find his soul satisfied. What is the mark of a good meal? Satisfaction! David says in 63:5 – “My soul is satisfied as with marrow and fatness.” The NIV translates that last part… “with the richest of foods.” That is a health conscious translation to say the least. Marrow and fatness… the good stuff… that is what communion with God is like. Throw yourself into a little worship today! Let that Ipod blare some Chris Tomlin! Sing at the top of your lungs to some old hymns! Ashamedly worship in prayer and with tears and joy… alone or in the sanctuary. Want Him with all of your being. Pursue Him with all that you are! 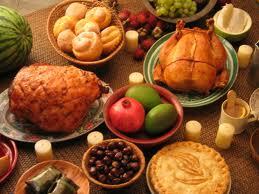 There is a feast waiting… enjoy your God!